Call Log Trimmer is an application that keeps your call log within a defined number of calls. It automatically deletes old calls matching the settings after a call is hang up. You can keep track of call log trimming progress on the notification bar (specially when your call log is very large). 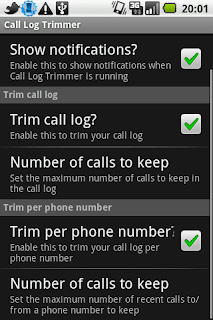 You can change the following settings by opening Call Log Trimmer. Very good app. Very useful indeed. Strangely enough, no other app worked for my phone. And man... make is paid!